Do you have a strong Search Engine Optimisation plan in place which will serve all your company’s needs for the next five years? Are you aware of what your competitors are implementing or planning around Search? Do you believe that one ranking on the first page of Google is sufficient when there are minimum 17 listings (including Google Adwords placements) on every first page of Google? How well do you rank for at least 200 relevant search terms? Of these 200 relevant search terms, which does your company regard as the 20 most crucial, in order of importance? Are you aware of all the domain names relating to your business which are currently available – and therefore vulnerable to being purchased by your competitors? Does your company have a clear vision and strategy re multi-website marketing campaigns aimed at doubling your online ROI within 12 – 24 months? Are you well versed on the differences between Onsite SEO and Offsite SEO , and the ratio with which your resources should be allocated to both? Are you aware of the impact that Social Media platforms such as Facebook, Twitter and Pinterest have on your website traffic and search engine rankings? Do you keep a close eye on your website traffic, most popular inbound search phrases and social media stats – and are these numbers growing? If you answered in the negative to five or more of these questions, you may wish to discuss these matters with us! Email Stewart Dawes: media@SEOtherapy.com.au or call 0413 276 780 during business hours. Over half our customers come from the internet now that we’ve successfully implemented SEO alongside Google Adwords. Recently we noticed our business went very quiet and within 10 minutes of being in our office for one of his regular sessions Stewart Dawes identified that our credit card wasn’t working in Google Adwords. Great to have such a detail-focussed professional working with us. Emma Boulton / Cath Brinsley, directors, Gynaecare Health Clinic. Our natural therapy college has grown from being a Melbourne-only campus to setting up, in 2012, in two other Australian cities, thanks entirely to the massive gains we’ve made via the Search Engine Optimisation of Stewart Dawes and his team. 48 percent of our revenue comes from his work. Brian Knight, CEO, The Health Arts College. We have the very best restaurants and cafes in Sydney and Melbourne contact us to stock our tea varieties and when I ask them how they found us, they almost always say “you’re all over the internet so clearly know what you’re doing”. Kerrie McMahon, director, Worldpartea. My website was nowhere and within 3 months Stewart Dawes had got it well positioned in Google Places. Then he built me a 2nd website and within 3 months of publishing it, my business went up by 50%. Sandra Cabot, Sydney hypnotherapist. Stewart got me ro the first position on Google for my most crucial search terms such as ‘mac repairs sydney’ and ‘mac technician sydney’. Business grew by 20% and stayed there. Stuart Snow, director, Mac Manager. As a small boutique furniture store we didn’t think we could compete with Australia’s largest furniture chains and outwit them on Google. But that’s what’s happened thanks to highly effective SEO. Customers often appear at our store with our web pages printed out, saying “I want this bookshelf” or “I want this dining table”. We’re into our third year of Stewart’s SEO program and every month we grow stronger. Con & Poppy, proprietors, Habitat Furniture Warehouse. Which 12-Month Program Will Suit Your Business? SMALL BUSINESS PACKAGE – “Get ahead of your competitors”. 18 x 3-hour Search Engine Optimisation sessions (the first 8 weekly, then one session per month). You will be required to supply articles as requested, effectively you will be adding an extra 54 hours of SEO work, under our guidance, to this program. Yes, let’s be blunt, it’s “homework”. Email for Quote. MEDIUM BUSINESS PACKAGE – “Dominate Your Industry”. For business people who want to remain focussed on running their business. We take care of every aspect of the program. We get you published widely on the web on websites which allow keyword-rich backlinks to your website. We also begin the process of creating a second and then a third website so you start to dominate your industry either within your city, or also nationally. Can also include Social Media management. Email for Quote. CORPORATE PACKAGE – “Dominate Your Industry Nationally and/or Globally”. In close collaboration with our professionals in search, online marketing, social media, content marketing, mobile app creation, video production, outsourcing and website design, you choose the level at which you want to campaign – and the components you wish to include which best promote your business. From $2200 per month (minimum 12-month program). Email for Quote. What simple things can you do to improve your website’s SEO? Base your promotion on research rather than instinct – look and see what your competitors are doing, find out how your customers search or use bespoke software to find out how people are searching for your product/service. Hyper-link between pages wherever possible to encourage the search engines to “spider” the site, and use the keywords in the links. Use good content that engages your target audience on ALL pages, but which naturally uses the keyword phrases you would like to be found under. Make sure you are listed with Google Maps – it’s free! Try targeting specific sectors rather than generic terms e.g. “safety signage” or “school signage” rather than “signage”. You will compete more effectively and have more targeted visitors. What absolutely crucial things can you do to improve your SEO? Assign 70% of your search engine optimisation budget to “off-site SEO” – this will blow away your competitors who won’t do this – and so it will give you a massive edge – and enable you to get multiple results on Google’s first page instead of just one listing. Try to get links from very-high-traffic websites that Google already loves – because if they link meaningfully and accurately to you, Google will love you too. We specialise in this aspect and cannot be matched on this by any SEO company in Australia. Stop being conned by all the SEO companies who love to discredit their competitors with a damning phrase or two – realise that it’s easy to criticise and easy to hide lies behind criticism – as criticism is quickly assumed to be a sign of intelligence. Think for yourself and for once do not just go on “gut instinct”. Getting the most superior mix of SEO, online marketing, social media and Youtube videos will be one of the most important decisions your business will ever make. Do not be deceived that one link from an off-site article is enough. For an off-site article to be very successful for you, it needs to link in multiple times with highly-targeted keywords and keyphrases – do not allow SEO companies to fob you off on this matter. We own 3 high-traffic media websites that have been around for a decade (Google gives much higher rankings if websites are aged) and these websites are ideal for publishing articles about you and your business. These articles can be highly informative or light-hearted lifestyle pieces about our clients – but they all have one thing in common – they’re strongly and meticulously linked to your website – and these articles will in themselves rank very highly on Google. Then when they’re high on Google, because they link heavily into your site, they are the most singular factor in causing your site to climb the rankings to heights you certainly won’t reach any other way. These websites are www.sydneycafes.com.au (publishing since 1999 – over 1400 unique users per day), www.freshmag.com.au (publishing since 2002 – around 1800 unique users per day) and http://www.westcoastcafes.com.au (publishing since 2001 – over 800 unique users per day). 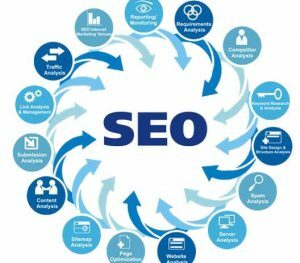 No other SEO companies that we’re aware of – anywhere on the planet – have quality, high traffic media websites at their disposal to offer this most crucial linking aspect. We write highest-quality articles which then link to your website. But they don’t just link heavily, they link with absolute targeted relevance. This absolute accuracy performed on a high-traffic website will not just get you to the highest possible position on Google, but will give you multiple results on the first page too. In the case below, 3 out of the first 4 results. How do these articles rank? You’ll observe on the below image that the three organic search results in purple are 1. Our client Ollie and Max, then 3 & 4: Articles on the high-traffic website Freshmag.com.au that are about Ollie and Max, and link heavily to their website. Giving them in effect, 3 out of the top 4 results for the search “women’s casual shirts” which is their exact market target. And these two articles are the ‘magic’ that has pushed them – from nowhere on the search engines – up to the number 1 position. To contact us email Stewart Dawes media@seotherapy.com.au or 0413 276 780 – or fill out the short form on our Contact Us page.